The naming of two streets near Middleborough Four Corners in the second quarter of the 19th century was the product of a local adversarial political relationship between Peter H. Peirce (1788-1861) and his nephew, Philander Washburn (1798-1882). Peirce, whose fortune would later benefit Middleborough as the Peirce Trust, was an astute businessman, operating a store on North Main Street and holding an interest in various industrial operations locally. Peirce was able to parlay his commercial success into an influential political position as a Democrat at a time when that party was noted for its conservatism. Nathan King later described Peirce as having “more influence than any other, perhaps, among his Democratic friends” while James Burgess flatly stated that “Peter H. Peirce ran the democratic party”. Consistently described as a “Democrat of the old school”, Peirce was likely to have supported typical Democratic issues including states rights, minimal government, and the Jeffersonian ideal of the nation as a populist agrarian society. And while many Democrats took a pragmatic stance upon what would become the key issue of the day, slavery, Peirce avowed in 1839 that he was “opposed to slavery in all its forms, and would, were [he] possessed of the power, remove the same from the Land and the World.” (This assertion notwithstanding, Peirce supported pro-slavery presidential candidate John C. Breckinridge in 1860). Peirce would serve three terms (1826-28) as a Democratic state senator, and his dominance of local Democratic party affairs would help consolidate Middleborough’s position within Plymouth County as the “Gibraltar of Democracy”, a community which was regarded as reliable in its conservatism. The mid-1820s, however, would mark the peak of Peirce’s political fortune, and in the 1830s and 1840s, he would consistently be defeated in political contests by opponents, including representatives of a new political party – the Whigs. Formed in 1834 as an opposition party to Andrew Jackson and his policies, the Whig party was a coalition of diverse forces united largely by their antipathy towards Jackson, though certain objectives such as support for the creation of a national bank and federal spending for internal improvements were generally commonly shared by its members. In contrast to the conservatism of the Democratic Party at the time, the Whigs became the liberal party of the era, promoting educational and prison reform, an expansion of the democratic franchise, and temperance, and opposing territorial expansion, capital punishment and (for the most part) slavery. Representing these views locally was Peirce’s nephew, Philander Washburn, the son of Peirce’s sister Elizabeth (Peirce) Washburn. Though less driven by an entrepreneurial spirit than his uncle, Philander Washburn nonetheless owned a number of interests in burgeoning industries locally and he was a prominent economic force within the community. (His South Main Street home now houses the offices of the Middleborough Gas & Electric Department). The characterization of Whigs like Washburn as richer and more urbane than the average American, though intended by Democrats to damage their opponents, did little to dissuade voters from choosing Whig politicians. (Peirce, in fact, was no less well off than Washburn). Middleborough, traditionally conservative in its politics, continued to vote for Democrats throughout the 1840s, though Whigs increasingly made inroads with voters. In 1847, Whig William H. Wood who was elected as a state senator also defeated Democrat Eliab Ward for the position of Middleborough Town Moderator, sending a signal that perhaps the Democratic dominance of town affairs was in jeopardy. The following year, in 1849, Middleborough in a Congressional election voted Whig for the first time in its history. This upsurge in Whig support would also help sweep Philander Washburn into office as a state senator in 1849 and 1850. Reflecting the disparate political views of Peirce and Washburn was the choice of the names they chose to bestow upon the streets they developed during the period. In the 1830s, when Peirce developed the roadway linking his store on what is now North Main Street with the industrial operations on the Nemasket River (in which Peirce held an interest), he informally called it Jackson Street, named for Andrew Jackson, the hero of all Democrats. Not to be outdone, Washburn later developed a street himself and named it for a favorite politician of his own. Running between the Central Congregational Church and Washburn's home, the street stretched southeastwards towards the Nemasket River from South Main Street. 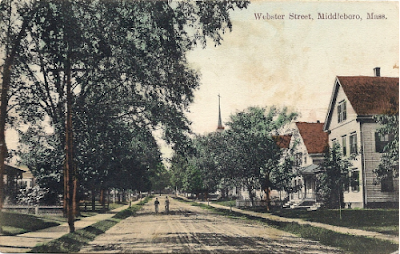 Though the street remained largely undeveloped until the 1870s, as early as the mid-1850s, it was known as Webster Street, named for Senator Daniel Webster of Massachusetts, one of America's foremost Whig politicians. Jackson and Webster Streets remain, equally distant from Middleborough Four Corners, a reminder of the 19th century political rivalry of both Democrats and Whigs, and Peter Peirce and Philander Washburn. "Webster Street, Middleboro, Mass. ", Taunton, MA: H. A. Dickerman & Son, publisher, picture postcard, c. 1910. Webster Street is depicted looking northwestwards towards South Main Street. The street was named for Senator Daniel Webster of Massachusetts by local Whig Philander Washburn. Two blocks away, Washburn's uncle and political opposite Peter H. Peirce developed Jackson Street which he named for Democrat Andrew Jackson. Fascinating story. Withe the Whigs being a new party united in their opposition to Jackson, I wonder if there are parallels with the Teaparty - who seem to be united mostly in opposition to Obama.